All aquaculture operations have occasional demand for drugs, biologics, and other chemicals, collectively referred to as “regulated products”. The Guide to Using Drugs, Biologics, and Other Chemicals in Aquaculture was developed by the Fish Culture Section WGADCB as a comprehensive introduction to the use of regulated products in aquaculture and a resource for fisheries professionals. 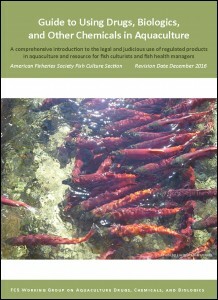 The Guide includes updated information on aquaculture drugs and contacts for providing feedback. Click here to access the most current version. A companion treatment calculator is available in both Excel 97-2003 (.xls) and Excel 2010 (.xlsx) formats. These tools are indispensable for those in need of detailed information regarding the legal and judicious use of these products in aquaculture. Check out the new Newsletter! New employment opportunity: University of Alaska Fairbanks is seeking a tenure track mariculture professor.